Sports Day is on Monday 23rd June - please click here for the schedule for the day. School are pleased to support the Elland and District Foodbank and will be organising termly collections in school. Please see attached copy of letter sent home. Andy Booth was our special guest in today's celebration assembly. He brought the play off trophy that Huddersfield Town won at Wembley and the children read out a number of sentimental messages that live long Town fans had sent to school about the Terrier Spirit that we share with the club. Miss Watson cried at the penalties again! Thank you to Huddersfield Town for their ongoing support for our children. The Christmas Secret Shop 2017 starts tomorrow - click here to see the timetable. School will be inspected by Ofsted on Tuesday 7th and Wednesday 8th November. Please click here for a copy of the letter to parents and here for the Ofsted Guide for Parents. If you would like a paper copy of the letter and guide, please call into the school office. Thank you. We will be holding our coffee morning on Tuesday 17th October from 9am and an additional coffee afternoon on Thursday 19th October at 2pm. Click here for more information. The parent open afternoons and nursery stay and play sessions will take place week commencing 23rd October. Please see the school calendar for exact timings. Thank you to everyone who came along to the leavers' assembly this morning and to our fabulous year 6. We now have a new app that parents can use to keep up to date with news from school. Click here for more information. The Summer Fair is on Monday 24th July at 3pm. Please click here for more information. Any donations of prizes etc gratefully received. Sports Day will be on Monday 17th July - for the full itinery, please click here. In September 2017, Cross Lane will be providing wrap around care from 7.45 am until 5.45 pm. Our new wrap around care club is called The Cross Lane Climbers and further information is available here. Cross Lane had much to celebrate at this weeks Celebration Assembly. Prizes were awarded for the Easter Bonnets and Egg Models. In sporting news both our Netball and Football teams had success in their matches this week. Class 4 won the attendance award with 99% attendance. Well done everyone! Some of our Year 6 pupils were offered an amazing opportunity to take part in a project called “Tackle the Future” due to the excellent progress they have made in science. This is a joint project between Huddersfield Town Football Club/Foundation (HTAFC), John Walton Machine Tools Ltd and Cummins Inc. which aims to engage students in engineering. This year the project’s focus will be on flooding and water management in light of the recent major flooding we saw in the region. The first part of the project took place today at Huddersfield Town. Twenty two schools battled against each other on Tuesday 7th March, all hoping to secure a place in the Calderdale finals. Cross Lane A came 2nd in their draw and Cross Lane B came 4th in theirs. Unfortunately only 1st place guaranteed to go on to the next level but the hockey players were a credit to our school and played really well. Captains were Mia and Ruby. Man of the Match was Ryan Gill. Our first match of the football saw us draw 1-1 with Elland C of E on Wednesday 15th March. Cross Lane took an early lead bu Elland equalised with only 40 seconds until the end! Great play from all 11 players. Captain was Ryan Gill, Man of the Match was Leo Jackson. The children in year 3 and 4 are studying the work of David Hockney in art this term. Today in the woodland Class 6 painted their own pictures using the backdrop of the wood on a beautiful spring day as their inspiration. The children in lower key stage two are reading the Railway Children Story and continuing with their Yorkshire topic this half term. They toasted crumpets and had drinks of tea linked to traditional Yorkshire food and old fashioned cooking. Congratulations to Cross Lane's Euan Craddock who was selected to be the mascot for Huddersfield Town. The children in classes 1 and 2 went to explore the winter conditions in the wood last week. They made footprints and drew shapes and wrote their names in the snow. For more news from the Woodland, click here. During topic week, Class 4 have been learning about the Arctic and Antarctic. We researched the different types of penguins that live in Antarctica. The children then enjoyed creating a large floor book, full of information and pictures. It was great fun! Santa came into school this morning to give out gifts to all the children. The whole school were treated to a fantastic performance of 'The Snowman at Sunset' by our Nursery and Reception pupils this morning. Class 10 completed their earthquake survival programme in the woodland today. Two of the children managed to make enough sparks to create a fire with the strikers. The foragers found stocks have dwindled to such an extent they could only find a handful of berries. The children made brooms from twigs and sticks. The shelter builders worked cooperatively and used their tarpaulin as a means to collect rain water by slanting it to the ground. A letter has been sent home regarding the open afternoons which will take place week commencing 5th December. The focus of the workshops will be writing. We look forward to introducing some of the new writing initiatives children are enjoying in school and helping you find ways to support your child’s learning in writing. There has been a light dusting of snow around Elland this morning and school is open as normal. As per the letter sent out this week, if the decision is ever taken to close school, Parents will be informed via text, the website and our social media pages. Click here to see a copy of the letter. Thank you. The book fair will also be open during Parents’ Evening. School gets commission for every book sold, which allows us to buy new books for the children to use in class. Please come along and have a look! A leaflet has been sent home on Friday 4th November, to give you an idea of some of books available. 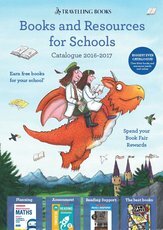 More information about the book fair is available here. KS1/2 - They need to think about their favourite book and create a poster to persuade others to read it. They need to say why it is a great book. Reception/Nursery – Need to draw a picture of their favourite book character and label it with the character’s name. We are having an open day to show off our fabulous nursery on Thursday 3rd November between 1pm - 3pm. Please click here for more information. It is with great sadness that we must report the passing of a much loved member of staff last week. Mrs Jean Gray was a member of staff for over 30 years and will be known by many generations of our school community. Representatives of the school will be attending the funeral on Wednesday and the school will be installing a lasting memorial in the nursery grounds. If anyone connected to school would like to donate towards the memorial, sealed envelopes can be handed in via the school office. Our thoughts are with Jean's family and friends. Year 1 and two made a map of suitable areas to build a shelter last week. This week they decided which would be the best place (based on water, fire pit etc) and built a shelter. Year 3 and 4 have been writing instructions in groups to tell someone how to build a shelter. During their forest school time they gave their instructions to another group. Each group then followed these instructions. They evaluated how they needed to change their instructions in light of building their shelters. Our next session will involve re-building the shelters with their new and improved instructions. The nursery pupils had their first trip into the woodland today and had an amazing time! Please click here for more information about the day. The after school programme for the autumn term is now available on the school calendar. Following the successful parent and child tennis taster session last week, we are looking to provide some similar events in the coming months. Watch this space! There has been some great work taking place in our Woodland already this term. Year 5/6 solving and creating algebra problems for their peers. Year 3/4 are foraging for food in the woodland (picking blackberries) linked to their Stoneage topic. Please remember to bring appropriate clothing, particularly footwear, for you class Woodland day! Congratulations to one of our pupils, Ella Buckley who raised £177.50 for Overgate Hospice. Ella walked 13 miles whilst taking part in the Midnight Walk. Well done Ella! We had a beautiful sunny day for the Street Party. Thank you to everyone who supported the Summer Fair. We raised over £600. Click here for the program which includes details of all the fabulous companies in and around Elland who supported us with donations of raffle prizes. See above for the winning ticket numbers. See here for more information. The rain stayed away (mostly) for Sports Day and we had a fantastic day. For a timetable of events click here. This week is National Diabetes Awareness week, and we are delighted to report that Cross Lane Primary School has won Diabetes UK’s Good Diabetes Care in School Award, a new recognition scheme introduced by the charity in September 2015 to raise the profile of schools across the UK that are providing good care and support to children and young people with Type 1 diabetes. Cross Lane Primary School was chosen by an assessment panel which included parents and representatives from Diabetes UK, who highlighted the support we provide to ensure students with Type 1 are fully included in all school activities and receive the care they deserve. Information about the Leavers' Disco on the 14th July has been sent home today. To download a copy click here. What an amazing afternoon of netball at the Brooksbank School Partnership Competition. Cross Lane entered two talented teams. Team A won their pool with maximum points and went head to head with Old Earth in the final, playing for a place in the Calderdale Finals. With great defending and creating chances at shooting, Cross Lane narrowly missed glory with seconds to go after Old Earth got a late but crucial goal. The Team should feel really proud to have played so well and come away with being runners up against such an experienced team. Thank you to the great support from parents! Class 10 were treated to some specialist cycling training on Wednesday 15th June, held at Brooksbank School. All bikes and helmets were provided by the school and concluded with pursuit racing. There are definitely a few future Bradley Wiggins and Laura Trott cyclists amongst the class! Class 9 will have a chance to sample the track on Wednesday 22nd June, then Class 11 will get their cogs turning the following week! Key Stage One had an amazing time at the zoo! A great day out enjoyed by everyone. Roxy with her thank you card from MP Craig Whittaker after raising £2505.38 for the Alzhiemer's Society. The huge decorative recycled plastic project that the Year 3/4 children have been designing, creating and making with the artist, Jude Wadley, is now complete. If you haven't seen it yet it is attached to the fencing near the main school entrance and looks fantastic! Well done to all the children, staff and parents who were involved. Here are a couple of comments from the children upon seeing the completed weaving. "It's better than the Eiffel tower and Big Ben." "I'll remember this moment forever." This year the Fathers' Day Secret Shop will take place from 7th to 9th June. Please click here for the timetable. The Reception children had a fantastic time at Kirklees Light Railway on Monday. They went on a steam train from Clayton West to Shelley, where they really enjoyed going through the long dark tunnel. The children watched the engine be turned round on the turntable and went into the engine shed to find out more about how the steam trains worked. The visit ended with time to play in the playground and then a ride home on the coach where lots of tired children fell fast asleep. Here are a few of the children’s comments about their day. The Key Stage 2 SATS are taking place this week - see attached timetable. The exams test English and Maths skills for 10 and 11 year olds and if you're getting ready for yours, don't worry. The Family Forest Day on Saturday was was a great success. The next day will be held on Saturday 25th June 2016. Welcome back to the Summer term and hopefully some sunshine. Many of our year 6 children have worked really hard through the holiday at our Easter School and had the first chance to enjoy the new ‘Monster Wall’ in the top playground. We are looking forward to a busy and successful term and whilst many of our children are having to prepare for tests we would remind you of the importance of an early night and healthy diet for your children. We are planning a forest school open day soon and are also looking for volunteers to help with the school allotment. See Miss Watson if you can spare some time to help dig, put up the poly tunnel or come and entertain the chickens. Have a great Summer and I look forward to seeing you all on the gate on Monday morning. The hockey team were fabulous on Saturday at their first ever West Yorkshire Games final in Leeds! After a nervous start they convincingly won 2 out of 4 games and were very unlucky to not win a 3rd. The best game of the whole day was, undoubtedly, the game against Elland C of E which, after full time was a draw of 1:1, it then went into sudden death after 10 minutes of full time play! C of E clinched it on a technicality but what an awesome 20 minute game! Huge congratulations to the squad on not only an outstanding performance today but throughout the entire tournament. The school will be closed today due to the continued heavy snow. Road conditions are poor and the site is a concern for the safety of our pupils. Apologies for any inconvenience. If you are worried about your child spending too much time unsupervised on their tablets. This is and app you can use to put the control back in your hands. We hope this helps! School will be celebrating World Book Day this year on Monday 7th March 2016. Children and staff will be encouraged to dress as a character from a book for the day. Children will be given a book token and reading activities will be taking place throughout the day. For more information about World Book Day click here. The PTFA Mother’s Day Secret Shop starts on Tues 23 Feb, until lunchtime Thurs 25 Feb. The Timetable is available here. The family forest event planned for Saturday 5th March has been postponed due to the weather. We will advise an alternative date as soon as possible. Great result tonight! Our team won all 4 games convincingly and are through to the West Yorkshire Games on Saturday 12th March! The team played 4 solid games and topping the table with maximum points was never in doubt! Awesome effort and teamwork from our very talented athletes! Cross Lane PTFA are delighted to announce that we raised a fabulous £515.25 from the recent Smarties Challenge. Cross Lane PTFA would like to thank everyone for their generous donations. Please see our PTFA page for more information. The PFA are continuing to support the victims of the recent floods, by organising a fundraising event in school. Other schools within the Calderdale area are also taking part in fundraising events on the same day. The money raised on this day will be split equally between the schools affected and the community. Week commencing 18th January, every child in school will bring home a Smarties tube, (any child with a food allergy, will receive an empty Smarties tube, plus an alternative item), then, throughout the week children can carry out chores at home in return for a 20p coin to refill the Smarties tube. EVERY pound raised and any additional gift aid will be match funded, meaning that the schools and people affected by the floods will receive £2.50 for every £1 you donate! You must return the completed gift aid form attached to the Smarties tube for Gift Aid to be claimed – thank you. Additional tubes of Smarties can be collected from the school office (once initial tubes have been distributed) for siblings or anyone else who wishes to take part. Please click here for a copy of the flyer which has been send home with all pupils today.